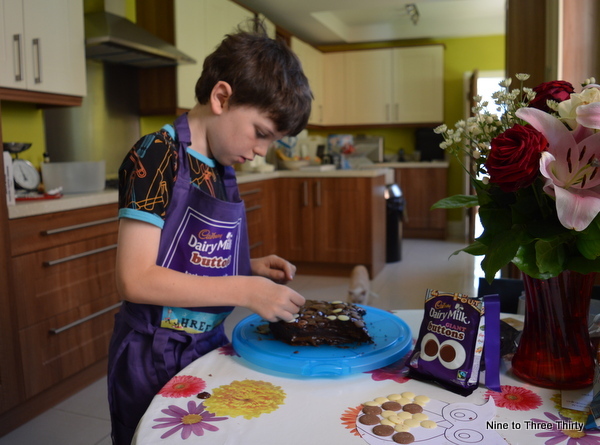 Cadbury Dairy Milk Buttons provided with all we needed to get in the kitchen (including an apron with our blog logo on) and make our very own owl cake, so H and I set to work creating our masterpiece. 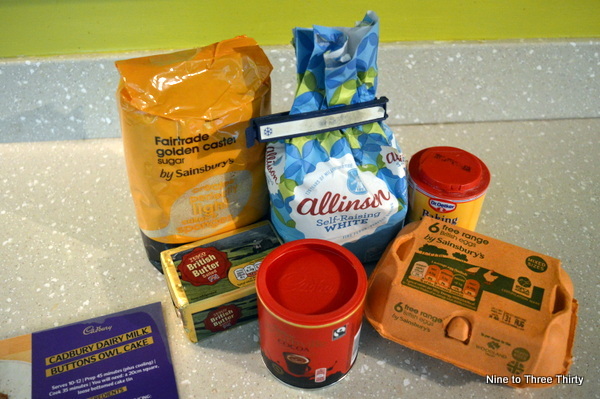 First up the ingredients – luckily we were provided with quite a lot of chocolate to make our owl cake especially chocolatey. I’m a great believer in using modern technology where I can and our rather ancient food processor got pressed into service to make things easy for us. Then the cake was baked. We made a square cake and then I attempted to draw a template for cutting out an owl shape. After some howls of laughter from H, I resorted to the internet for a free template. I cut out the shape and then put it on the cake cutting around it to create an owl shaped cake. 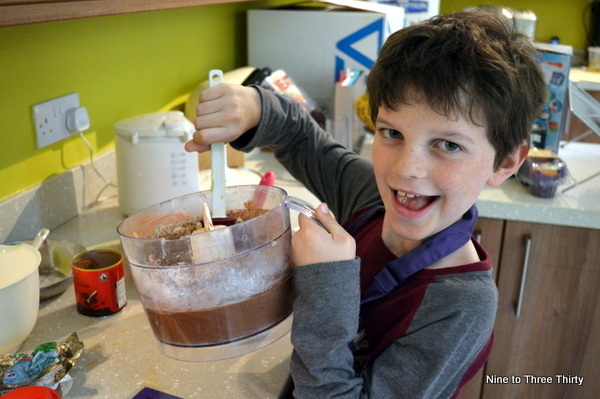 We made some chocolate icing. I’d forgotten to buy double cream (for the topping) so we made do with half-fat Crème fraîche and missed out the knob of butter – I’m guessing that made it a little healthier although that wasn’t why we did it. Then we started decorating our owl with the Cadbury Dairy Milk Buttons – we had a couple of different sizes and some white chocolate ones too. H might have snaffled a few in the interests of quality control: a good chef always tastes his food after all. We had owl cake for pudding tonight. Hubby seemed to think it was a fish-shaped cake, but quickly back tracked when he realised his mistake. Very nice it was too (whether it was owl or fish – try turning it through 90 degrees and it does look a bit fish like). 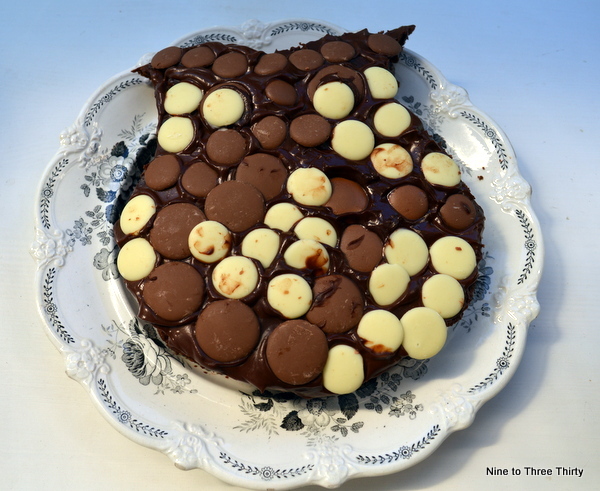 The buttons taste so much nicer for being made with proper Dairy Milk I think and our cake was wonderfully chocolatey. Cool apron with your logo! That cake looks gorgeous, I love chocolate! That looks naughty but very, very nice!! Can’t beat a homemade chocolate cake. It would be perfect for a Harry Potter fan!